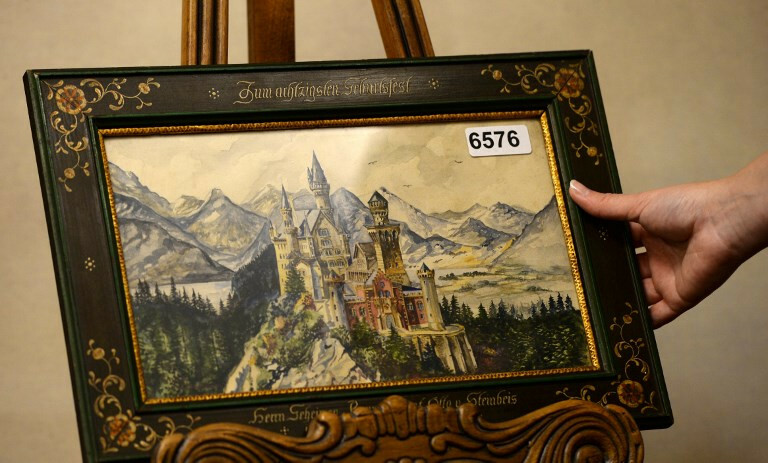 More than thirty paintings and drawings signed "A. Hitler" and presumed to be the work of the Nazi dictator are due to go under the hammer at a Nuremburg auction house on Saturday. The pictures -- from watercolors of pastoral scenes to sketches of female nudes -- will be sold at the German city's Weidler auction house, according to its website, which includes the listing of an Adolf Hitler "special auction" at the end of its sales catalog. The works include pictures either "signed or monogrammed by A. Hitler" and other furnishings, it said. They are in a variety of styles and mediums. "The items come from Austrian or rather European private ownership, originally from famous artists of the 3rd Reich, from heirs or from the estates of collectors," the catalog says. According to a report on the sale in the local Nurnberger Nachrichten newspaper the starting prices vary from 130 euros ($150) for a charcoal sketch, "Weinberg Monastery", to 45,000 euros for a watercolor entitled "Ortschaft an Vorgebirgssee", a scene of a village near a mountain lake. Hitler tried to enroll in the Vienna Academy of Arts as a young man but was rejected for lack of talent. He continued painting, however, and copied landscapes from post cards which he sold to tourists. The Nuremburg sale comes just two weeks after German police seized three watercolors presented as Hitler's works before they were due for auction in Berlin, claiming they were fakes. The Alpine and Rhenish landscapes were dated 1910 and 1911 and were signed A. Hitler and were offered by auction house Kloss.